A Voyager KC2 refuels two RAF Tornado GR4's over Iraq. 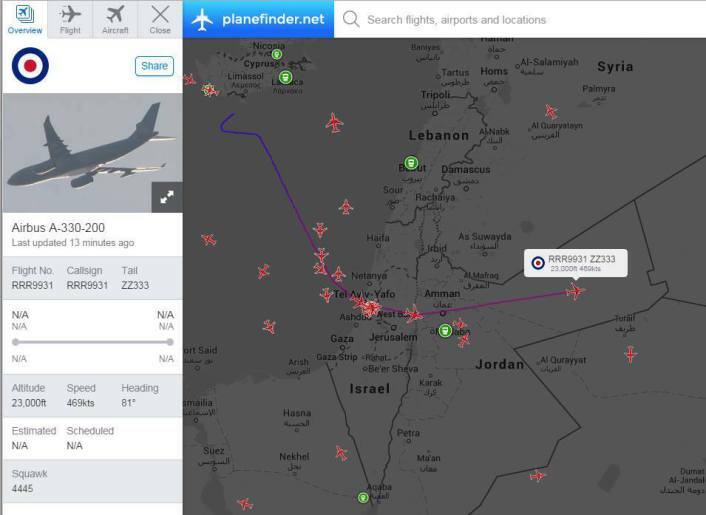 It’s currently possible to track some British combat aircraft around the world, including those deployed on operations against Islamic State. The Ministry of Defence however, isn’t worried. “Safety remains paramount. Most military aircraft are fitted with civil standard Mode S Transponders. Mode S transponders are primarily required by Air Traffic Control centres and for aircraft to identify each other as a key element of air-to-air collision avoidance technology. Open-source tracking is a bi-product of that safety critical technology. Many military aircraft with an operational role also have NATO Mode 5 military standard Transponders. Popular flight tracking websites track aircraft operating Mode S; they cannot track aircraft operating NATO Mode 5. When undertaking operations which are segregated from civil air traffic, NATO Mode 5transponders can be utilised and Mode S switched off. In addition, many of our military aircraft are fitted with appropriate defensive aids countermeasures and other force protection measures can be employed if deemed necessary. Although the majority of the aircraft you’ll be able to track using websites like Planefinder are airliners and business jets, military aircraft are also equipped with Mode-S ADS-B-capable transponder however, these are usually turned off if deemed necessary. Surely any emission can be triagulated? Not nowadays. LPI (Low probability of Intercept) is pretty standard on radars and radios. You can do all sorts of sneaky digital signal processing to hide radio transmissions in background noise or have them burst transmit or frequency hop at many times a second.